Stillwaters Healing Center offers Facial Rejuvenation and Body Sculpting services. If you want a way to have a more youthful and healthy look – for your face, arms, and/or body – please come in to Stillwaters Healing Center. Both procedures are performed using a specially designed machine that emits micro-currents through conducting wands to specific ‘acupuncture points’. But, no needles are used, so it is non-invasive. 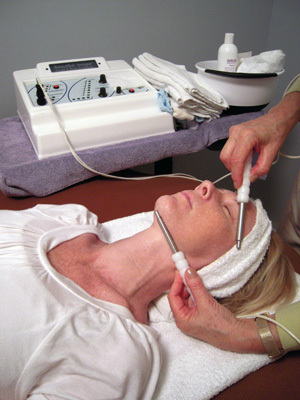 Micro-currents applied to facial muscles and skin help to lift, firm and tone. And because the micro-currents penetrate layers deep, they help increase the production of collagen which has the added benefit of smoothing and softening facial lines. The same principles apply to the rest of the body and help reduce stretch marks, sagging neck muscles, tighten flabby arms and more. In addition, this treatment increases blood circulation that helps flush impurities and reduce cellulite. The number of treatments you receive is based on your age, health and general skin condition. On average, ten to twelve procedures achieve results. After that, monthly treatments are recommended to help maintain your new look. There are steps you should take too, that include: healthy living, eating, exercise and drinking plenty of water. Limited time offer: Get your first facial treatment free. Seeing is believing. Visible results have been achieved with just one session! Call 407-772-9243 now for an appointment.